Do you want to quit smoking? We can help you! The consultation Anna Riccobene entrevistaon smoking cessation consultation at ICO has extensive experience in diagnosis, treatment and support of smokers who want to quit. The assistance activities have steadily increased in recent years, with an average of 130 visits per year and nearly 700 monitoring visits per year, that are accompanied by continuous follow-up via phone and WhatsApp. Importantly, approximately 48% of smokers whom we assist abstain from smoking at least one year after the start of the intervention! The consultation is based on complex care delivery and monitoring; it is personalized to specific patient needs in smoking cessation process offering necessary therapeutic support (psychological and / or pharmacist). The consultation is available for ICO patients and their family members as well as for professionals employed at ICO and other collaborating institutions. 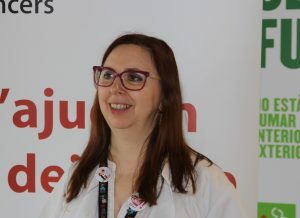 Anna Riccobene, the nurse specialized in oncology nursing and tobacco control with extensive experience in smoking treatment, is responsible for patient care. The administrative management of the Consultation is led by Maite Narváez and project manager of the Tobacco Control Unit of the ICO. Don´t miss this interview of Anna published on IDIBELL webpage. Do you dare quit smoking? Contact with us!